While these are an obvious choice for Valentine’s Day, they are also perfect for any day you want to say “I love you” with a sweet treat. Chocolate cake, fresh raspberries, and a dark chocolate ganache are combined and pressed into a baking pan. Once frozen, the mixture is cut out into heart shapes, which are then dunked in chocolate. 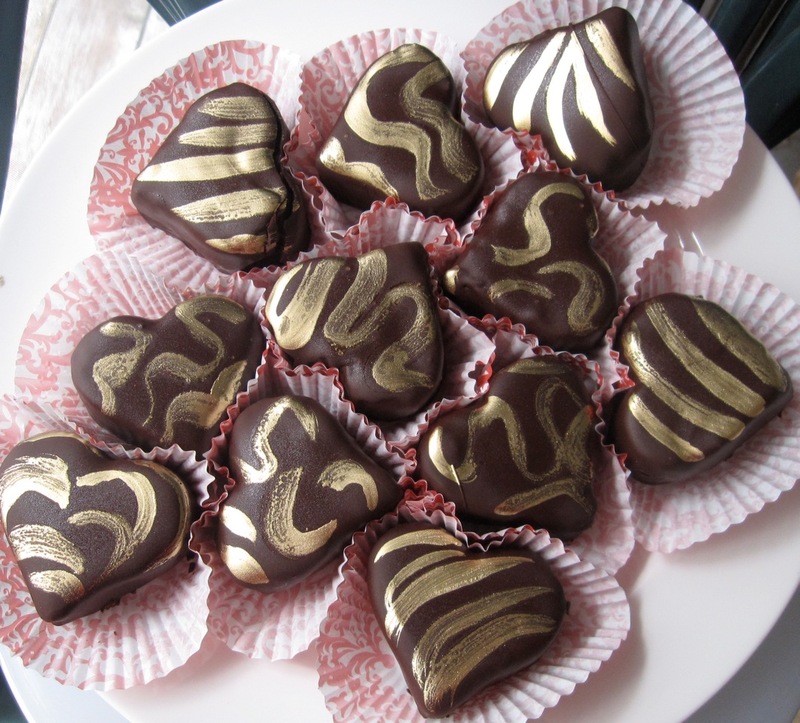 Edible gold powder, either brushed on dry or painted on wet, is a lovely finishing touch. 1. Line a 13 x 9-inch rectangular pan with plastic wrap so that it is overhanging on all sides. Combine the cake and berries, using a pastry blender to break down the berries. Add 1 cup of the ganache. Test by compressing and tasting and only add more ganache if needed for flavor and moisture. Press into an even layer in the prepared pan. Freeze until firm, at least 6 hours or up to 1 day ahead. 3. Melt the chocolate in the microwave or a double boiler. Dip the hearts one at a time in the chocolate, encouraging any excess chocolate to drip back into the container. Place, evenly spaced, on the prepared racks. Refrigerate briefly until the chocolate is just set. Place about 1/2 teaspoon of the gold powder in a small bowl. Add only enough vodka or almond extract until a paint-like consistency is reached. Using the brush, paint free-form designs on the hearts. The paint will dry practically immediately. Run a knife around the base of the hearts so that they come up off of the rack neatly. Place each heart in a paper cup, if desired.. Place in a single layer in an airtight container and refrigerate for up to 3 days. Bring to room temperature before serving. Note: Biscuit cutters are extra deep, which makes forming these hearts much easier than when using the more typically shallow cookie cutters. The cutters you use should be about 1 1/2 inches deep. Also, a cooling rack with both vertical and horizontal bars (a criss-cross pattern) will support your hearts better than a rack with only parallel bars.